To try 4 FREE issues of Aviation Week & Space Technology, click here. Sport aviation in the U.S. is experiencing increasing demand for personal flying as a potential alternative to the major airlines, but industry officials fear that overzealous security measures will escalate the cost of flying and suffocate future growth. Kit-built aircraft such as the two-place KitFox appeal to first-time builders. The sport flying industry is attracting people who are interested in personal aviation. In the wake of the attack on America last September, an increasing number of non-pilots are considering learning to fly and either buying or building their own airplanes, according to the Experimental Aircraft Assn. (EAA). It has more than 171,000 members who design, build and fly their own aircraft including ultralights and lightweight helicopters, and boasts more than 1,000 local chapters with 95% of these located in the U.S. There are more than 750 different designs of amateur-built aircraft available to consumers, according to the Oshkosh, Wis.-based association. Tom Poberezny, president of the EAA, said the September attacks have had a negative effect on the sport aviation movement and aviation in general, and that their residual effects will linger for years. Tighter security and restrictions at airports and within the national airspace system are among Poberezny's chief concerns, especially for the long term. "We need to be sure not to take on security initiatives that don't have any bite and that become overwhelming financially." The popularity of early "homebuilt" aircraft, such as this Wittman "Tailwind," is declining as quick-build, all-composite kits capture a major share of the market. Building fences around airports to "keep people out is not the answer . . . we have to seek practical solutions that will produce results and are economically feasible," Poberezny said. Instead of striving to keep people out of airports and airplanes, "we need to get more people into the air," he said. In addition, the EAA and other general aviation organizations need to have a "collective voice" when dealing with Congress and the Bush administration, Poberezny said. MORE IMPORTANTLY, the EAA and officials of the Aircraft Owners and Pilots Assn., the National Business Aviation Assn., the General Aviation Manufacturers Assn. and the Small Aircraft Manufacturers Assn. (SAMA) are deeply concerned about future security measures. Their chief fear is that a wave of "overreactions" by the Transportation Security Administration and the Office of Homeland Security will inflict irreparable damage on aviation at all levels. A number of kit-built manufacturers have gained certification of their aircraft and entered production. The Lancair IVP is capable of speeds of more than 300 mph. "The really frightening thing is that security people within the Office of Homeland Security will be two steps removed from aviation and one step removed from the Transportation Dept., and they won't be part of the FAA," said Paul Fiduccia, president of SAMA. As a result, these bureaucrats "may not understand the consequences of what they do," and may not care because "they fail to comprehend the crucial importance of [general] aviation to the national economy and the American way of life," he said. According to Fiduccia, it is essential that the Bush administration avoid the "inadvertent dismantling or careless destruction of our industry" for the sake of national security "because they do not perceive small aircraft as an integral part of the country's transportation infrastructure." The experimental aircraft movement is a unique "incubator" for bringing new technologies to market. "Many of the technologies we see in certified airplanes today were first seen in experimental aircraft," Poberezny said. 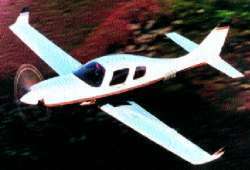 For example, Cirrus Design Corp., Lancair and the Eclipse 500 personal jet under development came out of the EAA and the experimental aircraft movement. In the past few years, Cirrus and Lancair have transitioned to commercial production. "Both companies are certifying and producing new models, and they have customers buying and flying them, and that's the bottom line," Poberezny said. The EAA's convention and sport aircraft exhibit AirVenture 2002 is scheduled for next week at Wittman Airport in Oshkosh and will celebrate the association's 50th anniversary. The event is projected to draw more than 700,000 people and 12,000 aircraft from around the world. According to the EAA, AirVenture is the world's largest air show and exhibition, outpacing both the Paris and Farnborough meetings. Poberezny said an increasing number of government leaders from China and Russia are attending AirVenture in an effort to learn more about the small aircraft business and its benefits. Although the EAA is a hotbed of innovation in airframe and engine design, materials and fuels research, it faces a series of challenges to make flying more accessible and affordable. These include reducing the high cost of building an airplane and learning to fly. "The biggest issue is economics of ownership and the amount of time it takes to learn to fly," Poberezny said. "People want to learn to fly, but [aviation] is competing against other forms of recreation that make it easier to get involved." "In today's society, time is more valuable than money, but to get involved [in aviation] takes a lot of time, and aircraft ownership takes both time and money," Poberezny said. According to the EAA, only one out of three student pilots completes flight training and earns a private pilot license, and "that's not good," he said. In an attempt to address that situation, the EAA is supporting FAA approval of a new Light-Sport Aircraft category. These 1-2-place aircraft would have a maximum gross weight of not more than 1,232 lb., and are reminiscent of light airplanes built during the post-World War II aviation boom. Poberezny said EAA officials are "working hard to ensure a good rule from the FAA." The regulation is tentatively scheduled to be issued in the first quarter of next year. To help provide an infrastructure for the rule, the American Society of Testing Materials is developing manufacturing standards for new aircraft, and the EAA and the FAA are hammering out standards for flight instructors involved in training Light-Sport Aircraft pilots. Poberezny said the new rule is aimed at attracting young people to aviation at the grassroots level. If successful, "we will create a new pipeline of pilots for the future," he said. In concert with the Light-Sport Aircraft initiative, EAA's Young Eagles program is aimed at introducing flying to 1 million children by December 2003--the 100th anniversary of the Wright Brothers first powered flight. As of late last month, about 800,000 young people had participated in the program, and Poberezny is confident that the final goal will be achieved. SAMA is a national trade association representing 30 manufacturers of small kit-built and production aircraft designed for personal transportation. It also assists manufacturers seeking FAA certification of their products. Fiduccia estimates that kit-built airplanes account for about 15% of the U.S. general aviation fleet. Companies that offer these kits, such as Van's Aircraft, "have a very important role to play in that capacity" to bring new aircraft designs to market, he said. Based in Aurora , Ore. , Van's Aircraft sold about 650 kits in 2001 and has more than 1,000 airplanes under construction worldwide, according to Richard VanGrunsven, president. The average cost to build one of the company's planes is about $50,000, he said. Fiducciasaid high-performance sport aircraft such as the Lancair IV are a "plausible transportation tool" for trips of 300-500 naut. mi. Many kit-built and production sport airplanes are capable of cruise speeds of more than 200 mph. and routinely beat the airlines in terms of overall time expended for a trip. In addition, constant advances in avionics are making navigation easier and more informative for experienced and neophyte pilots alike. Digital, fully integrated avionic suites that combine GPS satellite navigation with the FAA's Wide Area Augmentation System, in-cockpit graphical weather, communications data link and sophisticated autopilots are reducing pilot workload significantly while improving flight safety and efficiency. Development of small, ultra-lightweight turbofan engines such as the EJ-22 currently being developed by Williams International for the Eclipse 500 could spawn an entire new line of small jets with cruise speeds of up to 500 mph., Fiduccia said. Acquisition cost, however, will be the major determining factor driving whether these new aircraft succeed. Despite these and other promising technological advances, the small aircraft industry is fighting strong headwinds. Fiduccia said a weak U.S. economy is causing many would-be aviators to defer the purchase of new or kit-built aircraft. "Active pilots are flying, but those who want to learn to fly are postponing their training because of financial uncertainty," he said. The average cost of earning a private pilot license in the U.S. is $4,000-5,000. As for reciprocating engines, which power virtually all sport aircraft, a number of aggressive programs are underway in the U.S. and Europe to certify new powerplants designed to burn Jet-A fuel that is plentiful and available worldwide. Europe 's SMA company is nearing FAA certification of its six-cylinder engine this year. 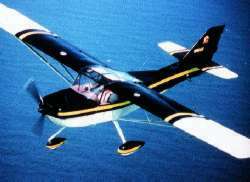 Initially, it would replace the Continental engine in Cessna Aircraft Co.'s Model 182 Skylane series. Although Jet-A piston engines represent a significant advance in propulsion technology for light aircraft, the cost of obtaining an FAA Supplemental Type Certificate to install the engine in an existing airframe will be substantial, according to Fiduccia. Despite the high cost, many owners will opt to install the new engine because the advantages far outweigh the costs involved, he said. © July 15, 2002 The McGraw-Hill Companies Inc.
Larry Kelley is watching, helplessly, as his business withers. Beacon Flying Service, a flight school established in 1937 and purchased by Kelley for $20,000 in 1994, is in limbo. That's because Hyde Field Airport is closed again, shut down by the Transportation Security Administration (TSA) in May, only two months after it had been reopened in March for the first time since Sept. 11. Larry Kelley estimates he's losing $10,000 a month in revenue while Hyde Field Airport remains closed. The airport is located 10 mi. from downtown Washington . Kelley is running out of options--he has already sold two of the five aircraft in his fleet. "That's what breaks my heart. I'm the guy taking a historical flight service and taking it down the tubes." So goes the roller coaster life of one flight school owner a stone's throw from Washington . Given Kelley's resume--he spent 32 years in the Air Force, was awarded six air medals and a Distinguished Flying Cross as a flight engineer in Vietnam, and became superintendent in charge of quality assurance for the 89th Wing of the Military Airlift Command, which included the Presidential fleet--it's clear the government's concern with the what-ifs of future terrorist acts is overriding its trust of any one operator. For instance, former FAA associate administrator for Civil Aviation Security, Adm. Paul Busick, has said that given the types of explosives now available, even a smaller aircraft has the destructive potential of a 757. By all accounts, Beacon's plight is a result of a "security glitch" between the airport management and the TSA regarding security protocol that Hyde's operators must follow, something that Kelley said he had nothing to do with. (The TSA last year took control of aviation security from the FAA.) Airport officials said the issues have been addressed, but the TSA has not released its stranglehold. Like Reagan Washington National Airport and two other small general aviation (GA) airports nearby, Hyde became the focus of intense federal scrutiny on Sept. 11. While most GA airports were reopened within two months, operators at Hyde, Potomac Airfield and College Park Airport , all in Maryland , languished until March, and despite intense lobbying by the business aviation community, Reagan National is still closed to both GA and air taxis. Reopening the three GA airports required significant restrictions on operations and strict security protocols agreed to by the airports, the TSA, the Secret Service and a half dozen other federal agencies. No traffic pattern practice was allowed, no transient aircraft were permitted to come in, and pilots, including new students, had to provide fingerprints and pass an FBI criminal history check and an FAA records check. Once vetted by the government, pilots received a personal identification number to be used when filing a special flight plan that must be approved by the FAA, the TSA and the Secret Service. In practice, pilots use procedures similar to an instrument flight plan to fly to and from the airports. After filing a flight plan by phone, a pilot will call Washington air traffic controllers for a clearance that includes a transponder code for the short trip to or from the outer edge of the temporary flight restriction (TFR) circle. For their part, airport managers are required to have in place a TSA-approved security plan that ensures a TSA-approved airport employee knows who's taking off and landing--the protocol that Hyde reportedly violated--and also makes it more difficult to steal an aircraft. For example, Kelley's aircraft are now fitted with throttle locks. AT POTOMAC AIRFIELD, 1 mi. west of Hyde, all outbound pilots have to check in at James A. Davidson's pilot supply shop before they fly, a practice Davidson said is one of three layers of security that Potomac put in place. 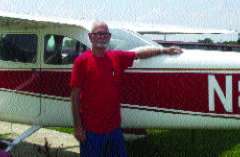 Davidson, owner of ATC flight training since 1997, said the flight procedures are "no big deal" and that once student pilots get acquainted with the measures, flying within the TFR becomes a source of pride. "You become one of the few people in the country allowed to fly in this area," he said. Davidson has seven aircraft, six instructors and 50 students, down 66% from the 150 this time last year. Even with the security levels that pilots must satisfy to fly from Potomac , Davidson said new students are not deterred, In fact, he's seeing an increase in applicants who work for the U.S. government and the military and "aren't afraid of security." As with most mom-and-pop flight schools in the U.S. , Davidson's business difficulties are linked to revenues lost during the government-mandated shutdown, likely insurance hikes for commercial insurance and the specter of a new round of security procedures. Those changes could be coming on Oct. 1 when the new Northern Command is scheduled to begin its task of coordinating the military's role in homeland defense. A source close to the deliberations said there would be a "large debate" as to what measures are needed to protect the public from potential terrorist threats using GA aircraft. Without additional equipment that could give the military more information about the intent of an aircraft flying under visual rules and not communicating with controllers, officials will likely need to put significantly larger no-fly zones around "sensitive" areas, according to the source. GA aircraft flying under instrument rules are not as much of a concern, he said, as controllers can compare the pilot's clearance with the aircraft's path. Critics say widespread GA restrictions are unwarranted when considering the limited destructive potential of a small aircraft. Given the security upgrades Potomac , Hyde and College Park airports have already achieved, Davidson sees them as somewhat buffered from what might happen this fall. In fact, he's turned what many see as an economic tourniquet into a plus for marketing: "My instructors have been cleared by the Secret Service, the FBI, and probably some other agencies we don't even know about." You can't ground pilots or aircraft or repress the flying spirit for long. In the 10 months since Sept. 11, the U.S. general aviation sector is returning to the flight lines determined to build a more positive image and hold on to a corner of the sky. An instructor observes a student pilot performing a preflight check of a Cessna 172 at Blue Grass Airport in Lexington , Ky. A Cessna 206 Stationair is in the foreground. "Pilots were uncertain as to when, if ever, [general aviation] would come back. For the first time, we comprehended we might lose that gift of flight. When you have the risk of loss of something that precious, you value it even higher," said John King, co-chair of King Schools Inc., multimedia training experts. "Pilots returned to flying with a renewed sense of joy and appreciation. The U.S. offers more flying freedom and mobility than any other country in the world, and all of a sudden we realized it," he added. Prior to Sept. 11, general aviation flight schools and pilots were quietly doing what they do and nobody much cared or noticed. Suddenly, everyone was aviation-conscious because terrorists trained at GA airports. "The public began to see a pilot as someone who likes to take risks, who is kind of a daredevil and in many cases irresponsible in conduct," said King. "They had no conception that learning how to fly takes enormous commitment and normally attracts capable, goal-oriented, high achievers." Arlynn McMahon, vice president of marketing at Aerotech Inc. in Lexington , Ky. , observed: "The current mood in the pilot community is one of resentment that the nonflying public views them as low-class citizens and a threat to the world. At the same time, however, they are no longer taking that certificate for granted and are becoming proactive in protecting it and building the image of GA."
Few permanently left the fold. The percentage is difficult to pinpoint, but Sept. 11 together with the continuing economic downtrend caused "some depression, about 10-15%, in the number of people who fly," King estimated. According to the Aircraft Owners and Pilots Assn. General Aviation Trends (see p. 61), the Air Transport Pilot sector was the hardest hit by last September's events. In the first quarter, 1,336 new ATP certificates were issued--a 38% decline compared with the first quarter of last year. The drop is due to a temporary decrease in demand for airline pilots following the attacks. Professional pilot candidates were totally discouraged from applying for airline jobs, but those who were 2-3 years away from airline careers were more optimistic, according to Drew Steketee, president and chief executive of Be-A-Pilot, a national educational program to raise public awareness of nonairline general aviation flying. At Aerotech, which normally certifies about 600 students yearly from private pilot through ATP from its three Kentucky schools, enrollments were down about 15% before Sept. 11, said McMahon. They dipped slightly after the attacks primarily because of "the general downturn in the economy that followed Sept. 11," she said. "People were uncertain of their jobs or how their lives might change." With each passing month, however, enrollments at Aerotech returned to a more normal level, according to McMahon. More pilots began upgrading their certificates after Sept. 11, and instrument students have doubled to 400 compared with a year ago, she noted. According to FAA Aviation Forecast 2002-13, 315,000 of 646,215 certified pilots will hold instrument ratings this year. King added that the percentage of those who go on to get instrument ratings is the highest it's been in the history of aviation. AOPA GA Trends indicate that instrument certificates are up 15% for the first quarter compared with the 2001 period. The increase is attributed to post-Sept. 11 flight restrictions, which required IFR flight plan filing, and a "general sentiment for increased vigilance when flying." The lure of learning to fly still draws them into the tent. AOPA projected that there will be 96,000 student pilots in 2002 and 104,000 in 2006. The FAA's Aviation Forecast 2002-13, however, predicts that there will be 83,000 student pilots this year and only 83,250 in 2006. However, it also is projectingan increase in private pilot certificates--to 270,000 in 2006 from 261,500 in 2002--and a rise in commercial certificates to 144,100 from 137,600 during the same period (see chart). AOPA President Phil Boyer disputes the FAA's forecast. The organization, which has 380,000 members, believes that the FAA understated the student forecast for the last two years, and that underreporting was partly due to the agency's switch to an electronic-based reporting system that generated a number of "orphan" records (student pilots who were not counted). Boyer stressed that an accurate student forecast drives the GA industry, and the FAA's being "wrongly pessimistic about the future" can negatively affect general aviation's economic recovery. The FAA is now reviewing its source-gathering methodology, but has no plans at present to revise the numbers, according to FAA spokesman Hank Price. Until the numbers are worked out, the GA sector continues to work to attract new students. The Be-A-Pilot program has generated about 20,000 new pilots since its inception in 1997, according to Steketee. The $2-million program, funded by a coalition of aviation companies, offers interested parties a $49 certificate for an introductory flight lesson at one of 1,700 U.S. flight schools. From 1997-2001, the program issued 140,000 introductory certificates and another 15,000 in the January-June 2002 period. Of that total 155,000, says Steketee, more than 30,000 have actually taken the introductory flight lesson, and of that number, about two-thirds have actually begun flight training. THE TARGETED AUDIENCE, says Steketee, is the ±50-year-old baby boomers who learned to fly in 1970s, 1980s and 1990s and may want to come back, as well as new prospects in their twenties and thirties. Steketee adds that after Sept. 11, another factor entered the picture in attracting people to aviation. Realizing that "life is short,people didn't want to put off doing things they loved, and wanted to smell the roses." Hal Shevers, founder and chairman of Sporty's Pilot Shop, said business has been running ahead of last year's at 22% average since Sept. 11. "We had one bad week [Sept. 11], but business increased 35% in October 2001 compared to the same month last year. We thought it was just a rebound from the September decline, and didn't think it would last, but it did." Shevers attributes the increased activity in personal flying to the "airport hassle factor," noting that "pilots don't want to wait in lines at terminals." Because of airport security, there's a resurgence in general aviation to use airplanes as a primary transportation tool, says King. Nevertheless, Steketee notes that people are not contemplating flight training just because of security delays. "It's not the overwhelming trend that some thought it would be." Many observers also agree that GA's image should be improved. "We need to be more proactive citizens in selling the idea of responsibility in our flying and promoting the benefits of GA to the nonflying public, such as connecting some 12,000 airports and people that would not be be served by airlines," King said. With continued flight restrictions and the nation growing more security-conscious, "what we may do is change the U.S. aviation culture in this country to the extent we become so security-conscious that we will impose an enormous burden on society and suffer a great loss of flexibility and opportunity--which would be very costly to GA," warned King. Shevers echoed the concern. "Ph.D.s and politicians are screwing up the national transportation system. What made America great? Common language, abundance of raw materials and a wonderful transportation system. Apparently, we are giving away the third."